After seeing so many beautiful bookshelves in response to last week's #FF question, I was inspired to reorganize my bookshelves. *Don't blame me for the gaudy purple and pink shades of paint on my walls. The previous tenant did that. Yuck. They'd been nicely arranged at one point but devolved over the months as I merely threw books onto the shelves rather than organize them. After a few hours of sorting, here's the result. Can you tell what the pattern is? That's right! I organized my books by color! With the exception of my special series bookshelf (Harry Potter, Twilight, Chronicles of Narnia, and books by Cassandra Clare, John Green, and Nancy Pearl), I paid no heed to series, author, TBR v. finished books. All that mattered was the color of the spine. It may become confusing someday, but I sure love the way it looks! I always love the look of this system! :D Great job. 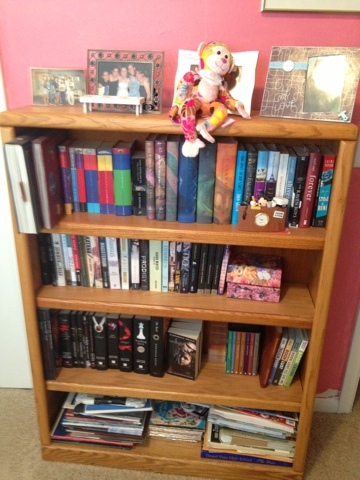 I love spectrum bookshelves :) I haven't done it with my own because I mentally organize books by topic, though. When I know I need the book about how to train a dragon or somesuch, I don't want to have to remember what color the cover was to find it. Love the idea of organizing by color. So pretty! 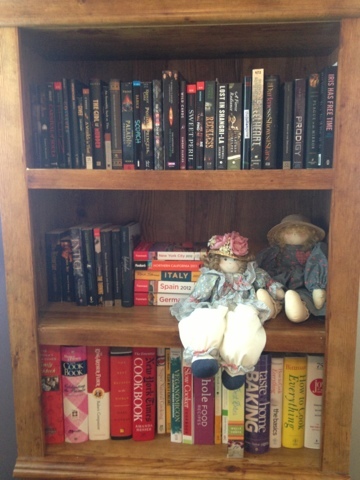 Also, I have a shelf doll just like the one next to your travel books (the one with the pink flowers on her hat). That looks amazing...my OCD would never let me do that but I love seeing other's shelves done this way! So pretty!! Very nice! I'm definitely in need of a reorganizing myself! Then I have my BEA books by date. It's looks good. I've been trying to put my books in color order and it's so hard ! I like how you have some books turned to the side. I love the way it looks, great first impression but that would bug me so much. I have to have all series and same author together and when I buy them they all have to be same height and style so they match. I then put all the same height books on each shelf. I'm very fussy and particular with my shelves. I've been saying for a couple of years I'll do a shelf tour, it's my blogoversary next week so I might do it for that. 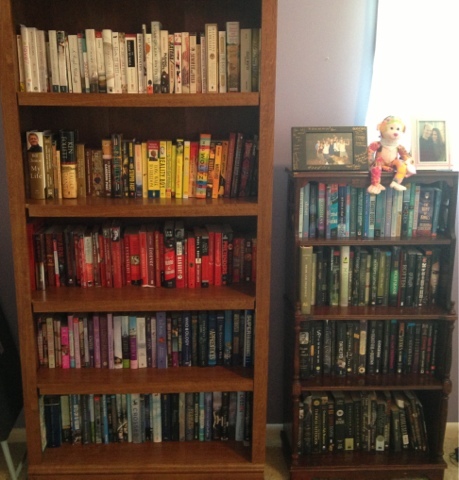 I love love love when people organize their books shelves by color. It is sooo pretty! If I had more books I would totally do this too.. but the lure of the free books from the library makes me not buy any books. It looks good ! 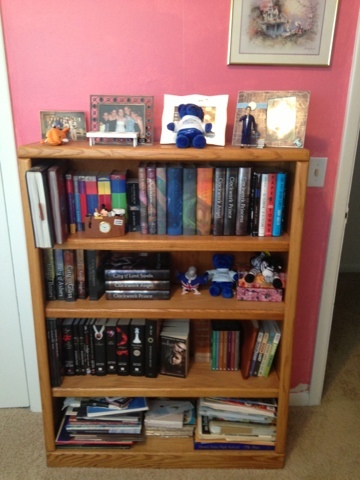 I just did my bookshelves in color order too. Also, it's awesome you have both the UK and US version of Harry Potter. I so need to set a day to do this as well. My books are messy piles. Your shelves look nice. I think I might do a rainbow case if I can find enough Yellow and Orange spines. 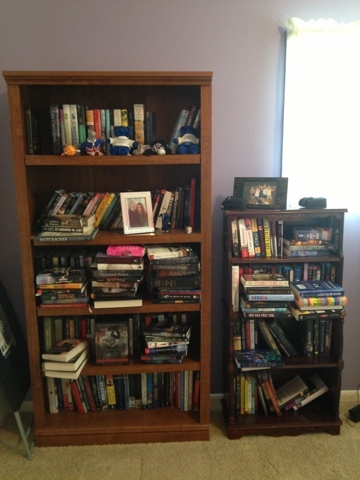 How long did it take you to reorganize? That does look cool! I think I would go crazy not having my series and authors together, but it does look really cool. And you have EMPTY space on your shelves! I can't ever keep up and have enough shelves, they are always overflowing. Looovee. I wish I could sort my books by colour, but I'm pretty sure most of them have black covers. So I couldn't create much of a rainbow. But I'm so envious of people who do have bookshelves sorted by colour! And you have both UK and American versions of HP!! Nice job! 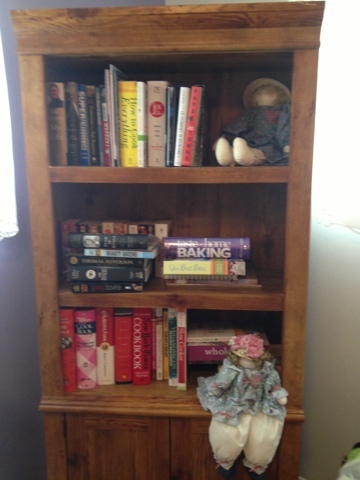 I really want to redo my bookshelves but feel like I'll need to devote some considerable time to weed some out for donation-maybe over Labor Day weekend. I love the color coding and think it looks gorgeous. Part of me would love to do something similar, but I think I'd probably freak-out if they weren't organized alphabetically. (Although do at least organize them by genre as well.) I have seen a single display shelf organized by color, and think they may be the way I need to go.